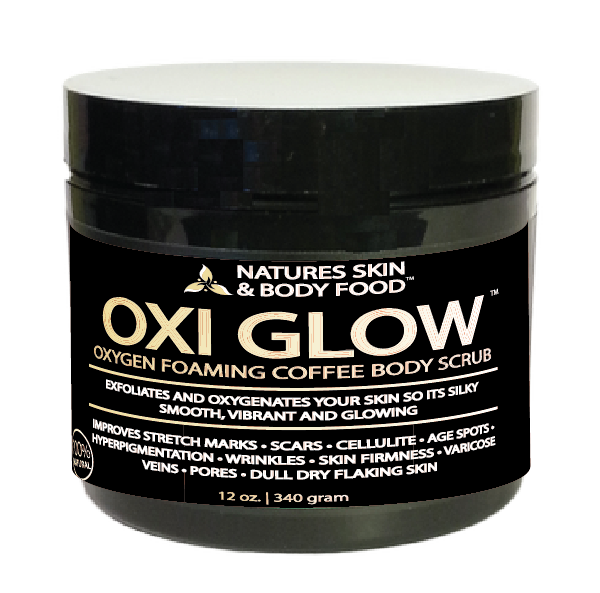 Oxi Gl;ow, an organic oxygen foaming coffee body scrub. Exfoliates And Oxygenates Your Skin So Its Silky Smooth, Vibrant And Glowing. Wrinkles, Skin Firmness, Varicose Veins, Pores And Dull Dry Flaking Skin. Have you ever wondered why people who exercise vigorously and frequently have better looking skin? When your skin turns pink after exercise the increased circulation flushes your outermost cells with oxygen and other nutrients. A major cause of aging skin is decreased blood circulation to the outer skin cells. This causes the cells to be deprived of oxygen and other nutrients and allows toxins to accumulate causing cellular death. Without giving away to much of our trade secret formula-the power of this product is derived from a rare clay deposit that we control and contains a large amount of oxygen trapped between millions of microscopic layers. When this clay comes into contact with our trade secret mineral activator and water the oxygen is released through tiny bubbles. While scrubbing these tiny oxygen bubbles are trapped in the oils and phospholipids and absorbed into the skin. The clay also provides 80 other bio-available minerals including fulvic acid one of the most powerful anti oxidants ever discovered. Our fast dissolving pink himalyan sea salt is combined with a perfect particle size fair trade organic coffee that gives you just the right amount of exfoliation. Plus the organic extra virgin olive oil has all of its anti oxidants intact and is teeming with full spectrum vitamin E. The Jojoba oil is organic and we we have added Ceylon Cinnamon and Organic Ginger Root for their high levels of polyphenol anti oxidants. When the ginger and cinnamon come into contact with the bubbling oxygen they penetrate deeper giving your skin elevated anti oxidant levels. The all natural saponified oils are added so that not only is your skin exfoliated its clean. Increasing the oxygen levels in your skin has many benefits. If you get burned and taken to a hospital they will put you in a hyperbaric oxygen chamber because oxygen stimulates the healing response. Oxygen depleted skin is lifeless skin. Start enjoying better lookilng, silky smooth skin now. Plus any product you use after this scrub will have increased benefit. This oxygen foaming coffee scrub is guaranteed to improve the appearance and health of your skin. If for some reason you don't agree simply return for a full refund. Directions: Thoroughly wet skin and take a small amount and hold onto the skin for a second or two until the product reacts with the water and starts bubbling-then start spreading and scrubbing. Alternately scoop scrub into your palm and sprinkle water until it bubbles then start scrubbing (do this before your first use so you know how much water is needed for the product to bubble, do not rub on dry skin). If using on your face use alternate method and use your fingers from your other hand to gently spread and scrub your face. Allow to sit on skin for a minute or two and then rinse. Not recommended for use on sensitive or freshly shaved skin. Do a skin patch test before use. Keep product container out of direct contact with water and keep tightly sealed between uses. Do not apply to much pressure when scrubbing, gentle scrubbing produces best results.